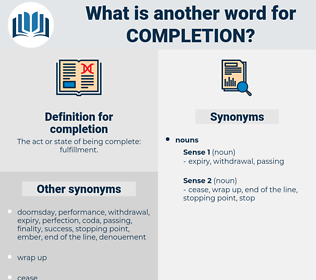 What is another word for completion? The act or state of being complete: fulfillment. Supplementing, finalising, diploma, compliment, participation. 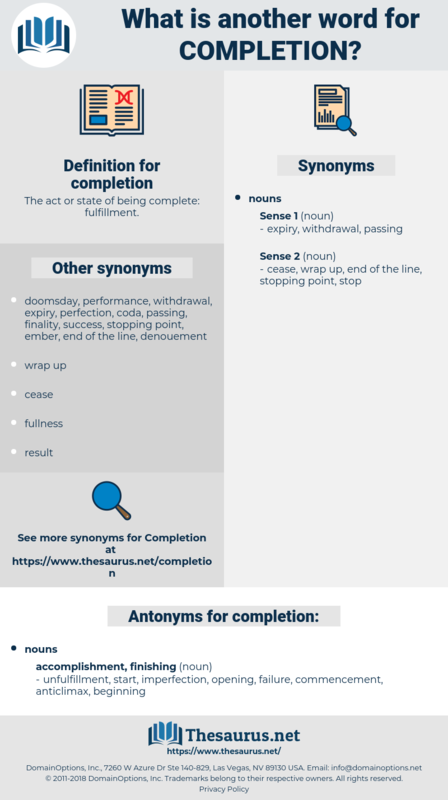 finalization, conclusion, conclusions, accomplishment, accomplishments, finalisation, termination, end, ends, makes, complete, completed, completing, realization, fulfilment, completes, finish, over-completions. culmination, consummation, completeness, finalization, expiration, conclusion, accomplishment, finalisation, termination, fruition, integration, discontinuation, graduation, perfection, commissioning, adjournment, end, formalisation, complete, completed, completing, inauguration, realization, formalization, consolidation, operationalization, publication, exit, fulfilment, actualization, continuation, introduction, adoption, presentation, climax, pursuit, reclamation, finish, refinement, materialization. fulfilled, effected, complete, completed, completing, concluded. unfulfillment, start, imperfection, opening, failure, commencement, anticlimax, beginning. Edwin was greatly disappointed, for he desired that since the work had commenced it might go right on to its completion. He lived to carry out his work almost to completion.